We've only got a few more days until we leave the country. I'm feeling vaguely prepared, gathering up the assorted electronics and other goodies. It seems there's a tremendous number of things to get ready. Sam and I have been hanging out with Emma in Bend. We played Rome: Total War (my ballistas and cavalry saved the day), Overgrowth (my ninja bunny moves are almost as good as his), and Arma 3 (where war tends to end horribly for us). Jessica was praising Sam's maturity the other day - he seems more apt to join in with the other kids and is generally more social than in years past. Joanna has song practice today. I think I'll briefly be inundated by children when Duncan's two friends come over. Other than packing and food shopping, I'm not sure there's anything critical happening today. The kids have all been enjoying summer immensely, finding odd little projects in the backyard. Messy, but fun. Duncan had his 8th birthday party last weekend, and I finally got around to assembling the video. We rented the little house at Washington park and all his friends came to enjoy the playground, eat cake, and participate in an made-up-on-the-spot Wizard 101 game. The next morning we had a family present opening, which was somewhat more subdued. I finished up with that fine beverage a few hours ago, but the caffeine continues to bubble away. It's Joanna's last day at work, but she's surprisingly busy and has been called out by multiple people for being so useful. Since it's unclear who will be doing her work, I think there's an excellent chance that she ends up with consulting work in the future. I got some leadership kudos for the provider compensation application I've been working on. It's weird moving huge sums of money around, but kinda interesting. Emma was over last night, briefly visiting before going off to Bend until next Wednesday. Sam's staying at home - he'll spend a couple days with Josh at the house before Jamie returns. I think Sam's looking for some time with his cousin, hanging out and playing video games. Joanna dug up vast quantities of garlic this morning, nicely braiding them and hanging them up around the kitchen door. I think she's vampire-proofing the house, but I'm too afraid to ask. We've got a couple of Duncan's friends coming over tomorrow. I'm hoping to hang out with Sam before the trip. Joanna's got some music things going on. We've all got to get ready to pack everything. I can't believe it's Wednesday already and a week from now we'll be flying out of the country. This morning we started frantically getting ready for the trip, sorting through electronics and making needed purchases. I think we'll be ready in time. The weekend was good. Duncan had a great party - renting out the little building at Washington Park. There were a ton of kids who ran about, and an impromptu Wizard 101 game that Duncan made up the rules on the spot. Cake was eaten. Presents were unwrapped. Emma had a play date with Kate. Sam and I played a ton of a certain bunny fighting game. Berry assembled complicated Lego sets for Duncan. It was a good weekend. Last night Joanna and I went to Off the Waffle and had a rousing game of Trivial Pursuit. The best part was the not-so-subtle hints we dropped as clues to the answer. Plus the tables were cool at their new downtown location. Joanna and I celebrated our one year anniversary last night, going out to Belly's for dinner and exchanging cards and gifts. 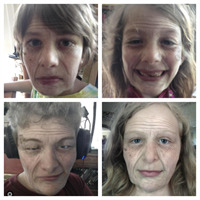 Joanna made her own, with her face "oldified". I think she was preparing me for the many years ahead. Fortunately she'll have lovely eyes and a brilliant smile when the rest of her goes all wrinkly. We had to chase deer out of our yard last night, much to the amusement of the kids. We have a pretty huge bounty in the backyard these days. Tomorrow we celebrate Duncan's birthday. Sam and Emma arrive from their Portland adventure. I'll be getting a mocha soon, and then diving into the piles of work that await me. 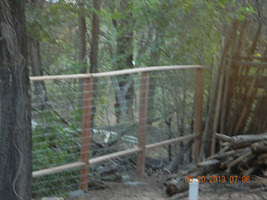 We finished the new backyard fence today. The (very) old one blew over this winter. 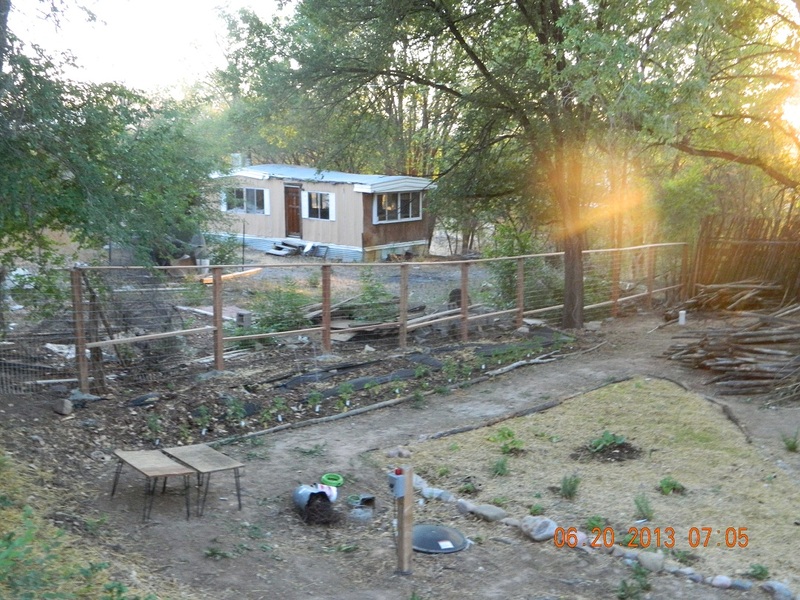 On Friday we're putting in another fence in the front. 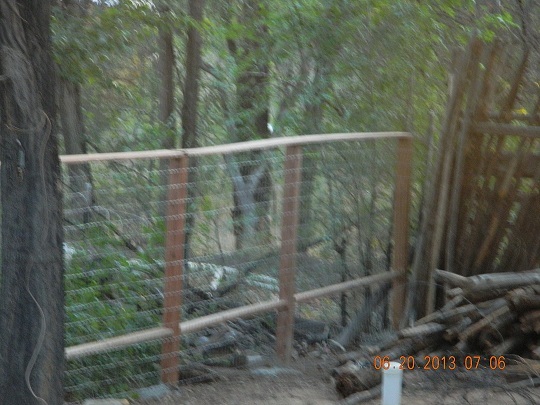 It will include a gate, but that will probably come later in the summer. Isabell and I took a few minutes to plant the squash, pumpkin, and green bean starts before heading in to clean up. She and Robbie are now playing games on the Wii, while I pretend that to stay awake for a few more hours. The summer projects are coming along, but after 9 months of exercising our brains more than our bodies, we're worn out! I need to learn how to convert our camera pics to a lower resolution so I can post them! 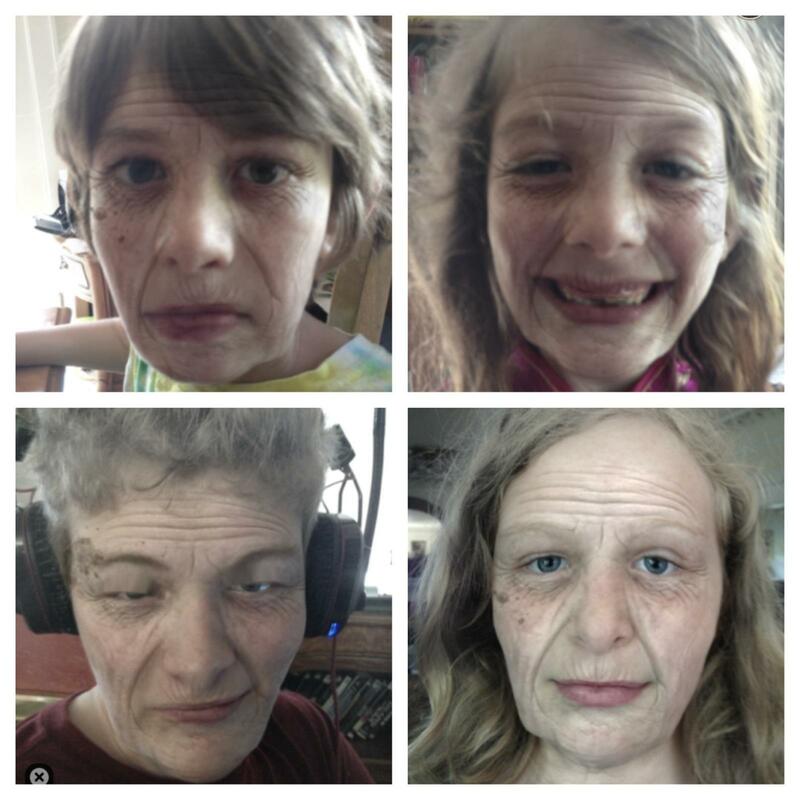 Jessica took pictures of all the kids today and then "oldified" them with some app or another. They all thought it was great, and Sam evidently couldn't stop laughing. 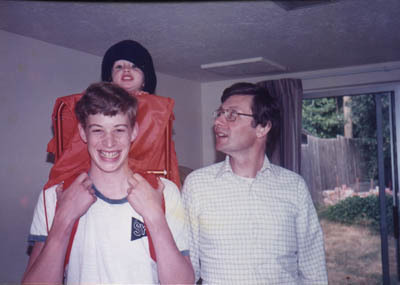 It's been a weird and wacky week, with the kids sticking around longer than usual as they left for Portland with Jamie until Saturday. I tried to spend a little extra time with them on Monday, and then inadvertently spent the day with them as I became deathly ill for about 12 hours starting at 3 a.m. Fortunately I was mostly recovered by the afternoon and spent time working and watching Sam play Scrolls. I'm a sucker for collectable card games, and Sam seemed to be enjoying it. Jessica took the other kids to the farm, and Emma dutifully said hello to the goats for me. This morning Berry went to the doctor, so Jessica took Emma and Duncan to my cubicle. They had a great time playing with all my weird stuff, and then left me after rearranging the Avenging Unicorn and all my coworkers' trading cards. It's quiet tonight, with only two kids. I think I'll start in on the laundry and maybe try to fix the tablet's power jack if I can muster the energy. I'll be of to work in the morning, so I wanted to wish all the amazing men in our family a happy Father's Day! You all do so much, please take a little time out for yourselves. It's a lovely Mocha Friday. I just finished my beverage of choice. Work is nutty, but interesting. It was a soon-to-be rare treat to drive in with Joanna, where we chatted about her final couple weeks at work and the latest people to leave the organization. Sam and Emma arrived last night, with much excitement on my part. Emma showed off her new Magic deck that she bought herself, and I played it against Sam (we both won a game). Sam's thinking of making a D&D campaign for Emma and I. He's also been playing a lot of games with Matt and Josh, just like the last couple summers. Summer schedule continues. Jessica has arrived, with cute baby in tow. There's a chore sheet for the smaller kids, along with computer sign in and out sheets. This morning Emma discovered Khan Academy and took her first lesson on evolution. We're trying very hard to get the Europe trip planned out. Train tickets are going to end up being pretty significant. Hopefully all these miscellaneous costs don't deplete our savings too much. Fortunately mom is paying for most of the big ticket items (thanks, mom!). Next week is likely quirky. I think Jamie is taking the kids to Portland Wednesday through Saturday. We'll have them a couple days extra to make up for it. Joanna and I have an anniversary coming up next Thursday. We don't have any particularly big plans for the weekend other than going to Saturday Market. Life's weird, uncertain, and pretty darn good. We went to Berry's graduation event at the Little French School. 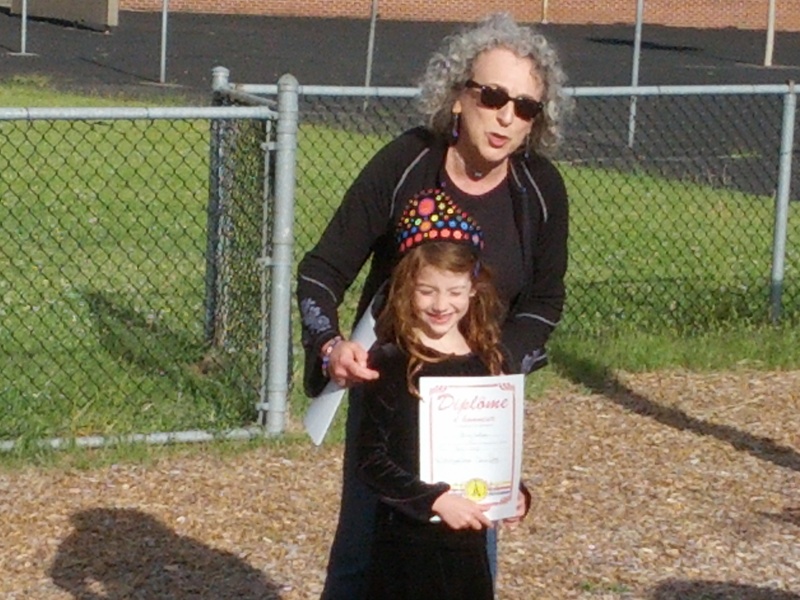 She cheerfully accepted her pin and diploma, then ran off to play on the swing set. I generally followed the kids around while Joanna networked, trying to drum up business for a possible future career as a freelancer. I think she got hooked up with some upcoming library fundraising campaign. It's strange having the last kid go through graduation there. It's been four years for Emma and two years for Duncan. Sierra, Emma's old teacher and sometimes babysitter, was leaving the school, headed for California with her family. Life seems a series of hellos and goodbyes. Summer has arrived. The kids had their last day of school on Monday, though Berry is going to the Little French School for one more day. Sam was sick this last weekend, so I excused him from his last day. Joanna spent time with the kids at school. I think they had a good time. We had a good weekend. 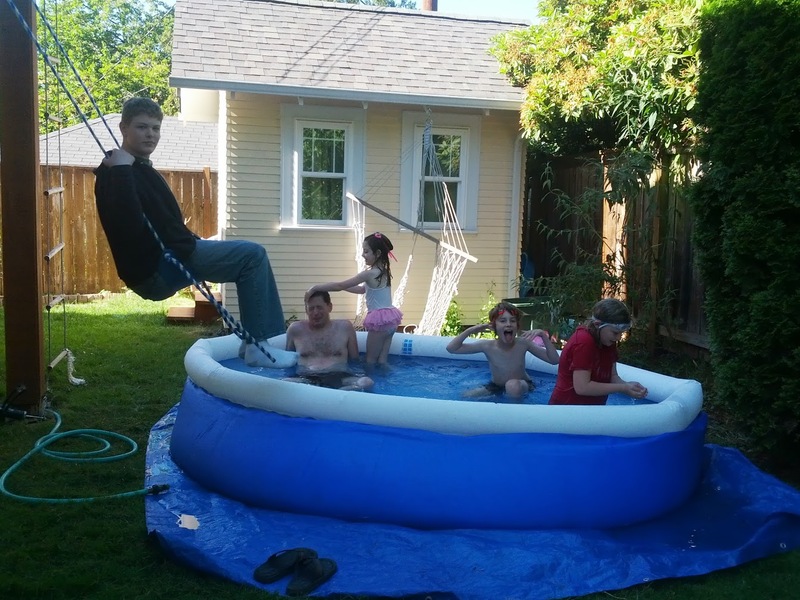 I set up the pool, and after a frustrating hour of gluing and duct taping holes in the top, it finally held enough water for most everyone to pile in. Sam passed on his usual leap from the swing, fully clothed, mostly because he wasn't feeling great. Sam, Emma, and I played D&D together, with the whole story ending up being slapstick comedy. Later there was playing Magic together. Sam made a bunch of decks and practiced on Emma, then later turned to me. Jamie texted me telling me than Emma bought her first Magic starter deck. My little nerdlings are growing up. Sam and I also managed to play the Company of Heroes beta. We slowly figured out the strategies, and ended up beating the AI soundly at one point. There are certainly stresses and quirky things in our lives at this moment, but then I think back to my family and everything else pales in comparison. Lest Duncan discover this blog and count the number of videos of Berry and find his video highlights lacking, here are a couple of videos of him from the assembly today. This first is his second grade class performance. I'm not really sure what they're saying. It's a bunch of classes performing a medley of songs in French that somehow relate to Charlemagne, their school. That's his teacher on electric guitar. And here's Duncan and his friend, Connor, enjoying the third grade classes' Macarena performance and joining in with their little wiggly bottoms. One upside of being laid off is that I no longer feel guilty volunteering at the kids' school. I've tried to make up for my lack of involvement this school year in the last two weeks. I volunteered for a while last Thursday morning, and captured Berry signing and singing an ABC song with her class. Today was the last day of school, which meant a performance from the Kindergarteners. And then we enjoyed Field Day with lots of jumping, tugging, hopping and generally having fun, followed by lunch and a popsicle. Emma led her first D&D session with Berry and Duncan. They had a great time. One of the great things about having a garden is that the kids feel free to pick goodies and gobble up fresh food. 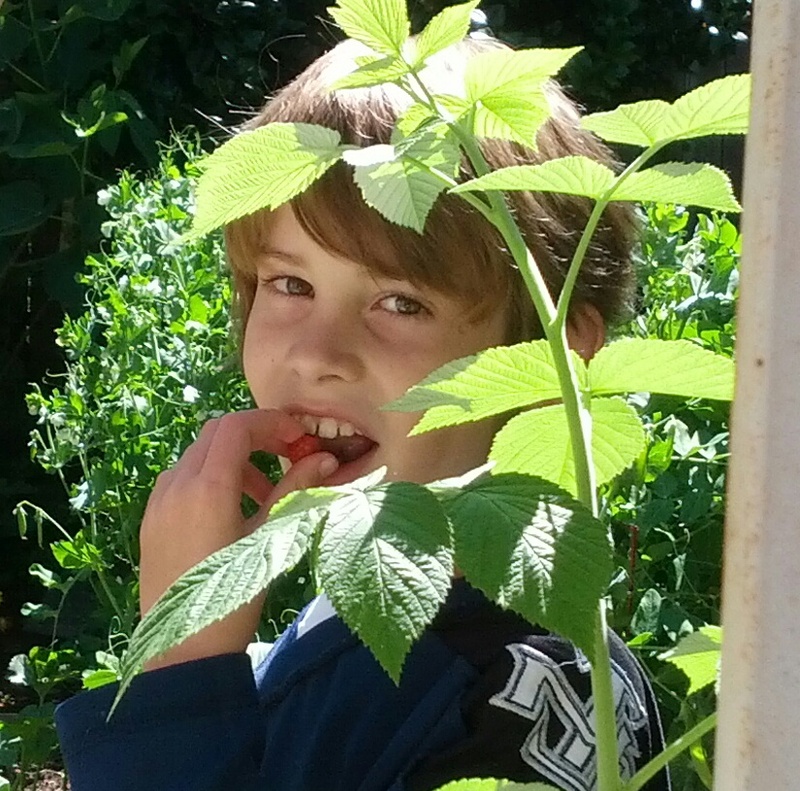 Yesterday Duncan discovered that the raspberries were finally ripe. Yesterday he also played D&D with Emma, I taught him to play Magic the Gathering, and he asked me to set up a public Minecraft server. The nerd is strong with this one. I wanted to join in with the rest of the crew wishing you a happy birthday. Happy birthday Sadie!!! I'm sending mental hugs your way. I can't wait to give you the real ones in a month! I've yet to drink my mocha this morning. I'll be meeting Jamie shortly at Metropol to talk about some challenging topics. At least the espresso will be an consolation. Summer is right around the corner. Sam and I worked late on his final project for US history - he was printing, scanning, and Photoshopping away until 9:30. Emma seems to have recovered from her cold, though both she and Berry seem to have a lingering cough. Duncan is his usual cheerful self, a little sad about not seeing his friends all summer. Joanna and I went out to dinner last night, walking over to Cornucopia on 17th and Lincoln. We haven't been at the gym together lately due to scheduling issues, so it was good to visit for a while. 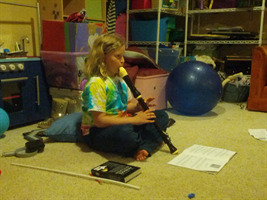 No word yet on a second interview at the U of O, so it may be that freelancing is in her future. It'll be nice when this gets resolved one way or the other and we can start planning the future a bit more. As for me, all is well. Work is fun, despite the typical organizational madness. I'm still amazed that I get paid to play with computers all day long. So, Isabell has decided to move outside for the first part of the summer. 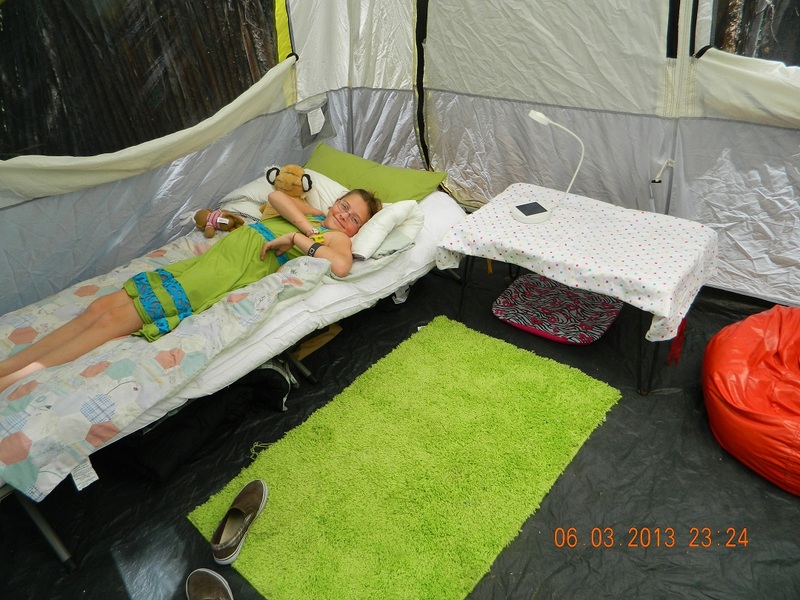 I'll post some pictures of her glamping soon! As usual, it's a crazy Monday. Emma is sick, so I'm staying home with her. Joanna is taking Duncan and Berry to school, then volunteering in Berry's classroom. Sam's first words were asking for painkillers, but I think he's going to school. It was a generally good weekend, despite the fact that three out of four kids were coughing and sniffling. Eugene had the highest pollen count of US cities, but I think they had a cold too. I got the kids outside on Sunday to play "basegolfo," an imaginary game Sam made up. As he pointed out, it was only practice, as real basegolfo requires rain. Later in the day we all played board games, including a couple that was cracking everyone up. Berry is getting to the point where she can read the cards and play, though she's a bit slow. Saturday was a little weird. Emma went to a birthday party with Kate and had a great time making a glass suncatcher. I went shopping and did plumbing while she was away. Sam returned from a sushi and Miyazaki movie at the new downtown Bijoux. As Joanna went to the coast for work, I had a somewhat crazy evening of pizza and Mythbusters, then getting three kids to bed. Sam and I watched anime, in part because he wants to take Japanese next year. I'm feeling a little stressed and unsettled. The kids' summer schedule isn't quite worked out and I've got to figure out issues with our Europe trip and such. Joanna hopefully has a second interview next week. Life just isn't quite as settled as I'd like it to be. 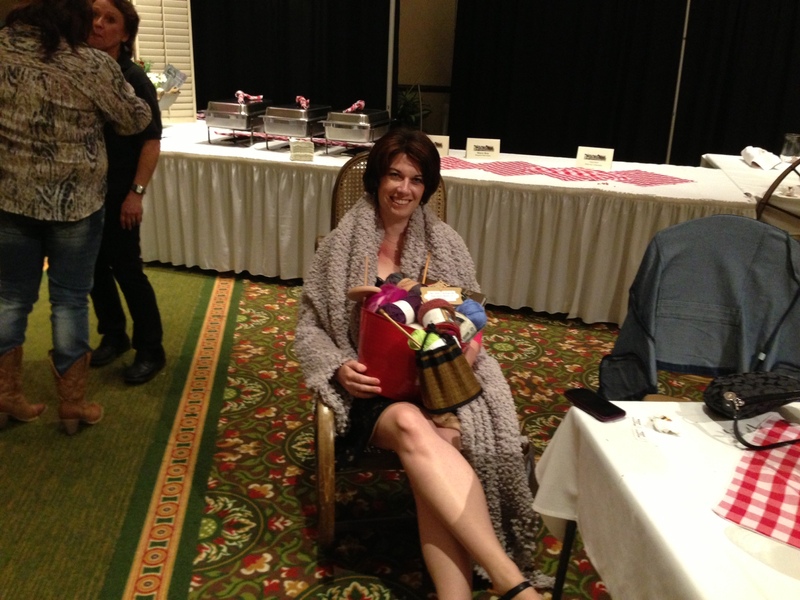 Joanna spent last night at a casino, part of a work event in Florence. Admittedly it's a little weird that she went, considering she's going to be let go at the end of the month, but it's been planned for a long while. In any case, I understand she took pictures and will write it up for a presumed future article to donors. 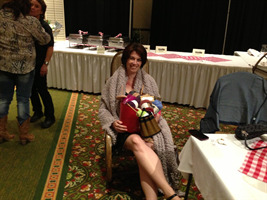 She did bid on one of the silent auction gift packages, presumably because she couldn't resist the lure of yarn. She ended up with a whole bunch of yarn related things that she wants to play with. I think the chair is going to Craigslist, though. 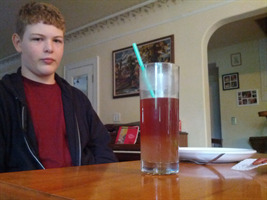 Sam's friend Evan has been singing the praises of bubble tea for some time now. Joanna got Sam some last week, but I think the flavor was a little too daring for him (some kind of melon). Yesterday at the store I picked up tapioca and this morning Sam made himself bubble tea. He loved it and was quite proud of his accomplishment.